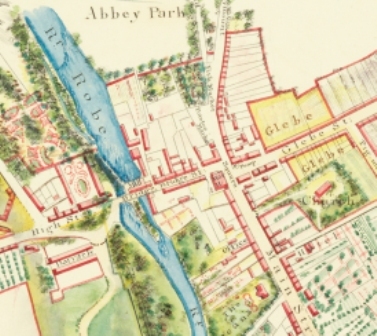 "Carrownalecka" asmarked on an 1836 map with adjoining School both on Glebe lands. 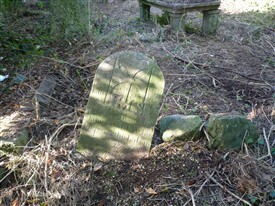 Carved gravestone of a James Walsh who died 1781 within Church. Located on the Ballyglass Road this ivy clad rectangle medieval Carrownalecka [Carnalecka] Church, sometimes called Holy Rood, sometimes Holy Cross and lastly Tempall Mór is in ruins. 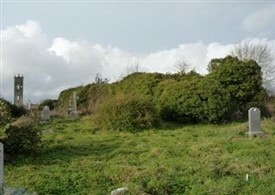 It is situated within the old graveyard and adjoining the current one. The ruin was built with roughly coursed limestone rubble on a protruding plinth. The poorly preserved remains of the north wall contain remains of at least two narrow lights in splayed embrasures; with a lintelled niche near east end. The south wall (h 3.4m) contains three narrow single-light windows, and a blocked up arch feature. An opening in the west wall was probably a doorway. The original large east window was altered for insertion of a later window, which was subsequently blocked up. The interior is filled with graves. 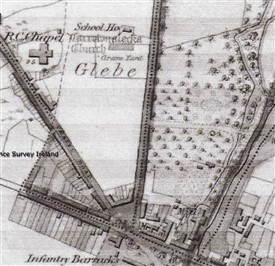 During Cromwellian times Tempall Mór was taken over and its land renamed Glebe lands. A school existed beside the Church. The earliest burial within the Church walls is c. 1735 and appears to be that of a William Hines [Hynes]. 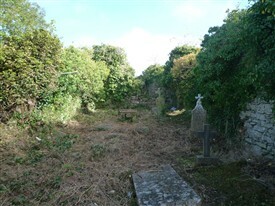 Recently, work on the old graveyard adjoining the Church, has been partly completed, and a list of burials is available from Mr. G. Delaney, South Mayo Family Research Office, Main Street, Ballinrobe. An Archaeological Survey of Ballinrobe and District including Lough Mask and Lough Carra produced by Lough Mask & Lough Carra TDA through FAS 1994. Quinn, J. F. History of Mayo. Vol 2 Brendan Quinn 1993. D’Alton, Monsignor. A Short History of Ballinrobe. A facsimile of the original 1931 publication republished by Richard Molly, Berry’s, Westport 1991. This page was added by Averil Staunton on 18/12/2010.